Journalism and Creative Media students help Oakdale Elementary students create a newspaper for their community. Through the C&IS course, News Design and Visualization, journalism and creative media students work with children at nearby Oakdale Elementary School to help the kids create their own community newspaper: The Oakdale Eagle. Founded in 2011 by a small group of Oakdale Elementary personnel and UA collaborators, the Oakdale Eagle has become a schoolwide endeavor. 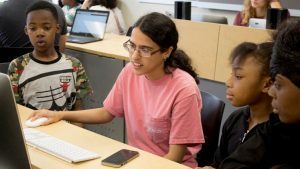 In 2018-19, 10 children worked as Oakdale Eaglereporters in tandem with 13 University of Alabama students enrolled in JCM 320 News Design and Visualization. By the end of the academic year, they will have published four editions of the newspaper for the Oakdale community. Oakdale Elementary is located in an economically disadvantaged area of Tuscaloosa, and a majority of its students come from low-income families. Dr. Rebecca Britt, who teaches the class is an associate professor in the department of journalism and creative media. She tells her students it’s important to let each child’s creative spirit shine through in his or her writing. “I had to take a back seat and know what I wanted to say wasn’t important; it was what the kids wanted to say,” says Jennifer Smith, a senior majoring in sports journalism. Latrina Spencer, an Oakdale Eagle faculty advisor and kindergarten teacher, says Zharia and her classmates have gained confidence through the program. “It lets them warm up to people and come out of their shells,” she says. Britt says the relationship between the Oakdale Elementary community and the UA students is reciprocal. The experience enhances the UA students’ communication and collaborative skills and gives them a chance to interact with the Tuscaloosa community and develop their portfolios, she says. Oakdale Elementary recently extended its journalism program internationally by forming partnerships with schools in El Salvador and Kuwait. Melissa Kent, the library media specialist at Oakdale Elementary, says UA students and faculty have assisted throughout the expansion process. Dr. George Daniels, assistant dean of administration for C&IS, was instrumental in establishing the UA-Oakdale partnership. Daniels coordinated a professional-development event in which Oakdale journalism-program advisors me with UA communications faculty members. He also has introduced Oakdale teachers and students to opportunities in public speaking, global communications, broadcasting, public relations and more. “He has been the guiding light to developing this program,” Kent says. 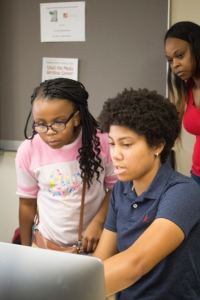 The alliance has fostered an extraordinary program for the young minds of Oakdale Elementary, Britt says, and some children continue pursuing journalism projects in middle school. To learn more about Oakdale Elementary School’s journalism program, the Oakdale Eagle, or the JCM 320 News Design and Visualization course, contact Dr. Rebecca Britt at rkbritt@ua.eduor Dr. George Daniels at gdaniels@ua.edu.